Costa Rica is one of our favorite countries – in fact, it’s a favorite of so many Americans and Canadians that its reputation as a perfect vacation destination has become clouded with the myths that there is no local culture left and that it can’t be done cheaply. We even met overland travelers that rush through Costa Rica, operating under the belief that it isn’t worth the visit. DON’T BELIEVE THE HYPE!! Costa Rica is magnificent – with emerald green jungles and wildlife in every direction. Costa Rica is so abundant in tropical fruit and beautiful vegetables that you will be healthier despite yourself. Don’t get us wrong – it CAN be expensive, wherever you find good roads, clean water and tourists, you find higher prices. But it doesn't have to be. We have been to Costa Rica three times – twice for short, week-long vacations and once, for three months (the maximum allowed for our vehicle import permit). In our time there we learned so much about how to do it all and do it cheaply. Here, we share some of that knowledge with you. Costa Rica’s high season is between October and May. Prices will be higher, availability will be lower and beaches will be crowded with speedos and the smell of Coppertone. The rainy season in Costa Rica is solidly heaviest from June to August. The sweet spot and our favorite times to visit are the middle-end of May and September. Everything will be cheaper, everything will be less crowded. The weather will be perfect. During these times, the rain will come in for 2-3 very predictable hours around dinnertime and that’s it. You won’t mind that rain because its perfect, a warm downpour complete with brilliant thunder and lightning, cooling you down after a hot day at the beach and giving you the complete Central American weather experience. A perfect time to take a nap or go to dinner. Directly after a rain, the sounds of the jungle come to life setting the perfect scene for an after-dinner glass of wine or sunset beach walk. This is a tricky topic because every traveler is different and wants for different things. If you are in a car and into car-camping, DO IT. 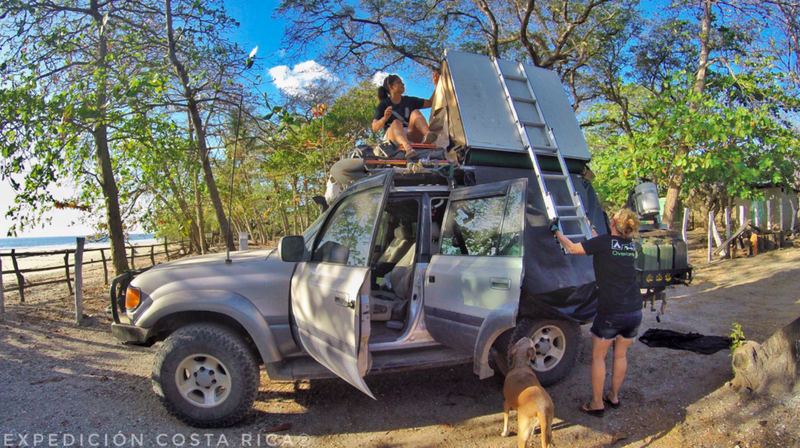 Costa Rican beach camping is some of the best (and safest) in the world! You will find entire communites of people camping on beaches for months at a time. We recommend doing the coastal circuit of beaches on the Nicoya Peninsula and further south near Dominical or finding one of the many camping spots around Lake Arenal. The best part? It’s FREE! And if you aren't comfortable wild camping this way, Costa Rica is well set up with formal campsites. Okay, lets say you don’t want to camp or if you’re an overlander, you just want some time off the road – this can still be done cheaply. We spent seven weeks in a mansion with a pool, overlooking the ocean and guess how much it cost us? NOTHING! It was a housesit. There are several housesitting websites, which we talk about in the resources section of this site – trustedhousesitters.com, housecarers.com, etc. where, especially in the off season, you may stumble into a five-star experience with the only responsibility being watering plants or feeding a dog. Second, find the expat pages for the community you are visiting. These pages are full of non Costa Rican individuals who own properties or rooms that they rent VERY cheaply during the off season. Logically following, try out Airbnb or VRBO – in the off season, you will be amazed how inexpensive things get – and check out our blog post on the Art of Airbnb – the off season is a fantastic time to negotiate. For the more adventurous budget traveler, Costa Rica is FULL of hostels and unique camping experiences; some are one in the same, like Hostel Alouatta, which rents luxury yurts. Hostels aren't what they used to be - far more, they resemble boutique hotels and offer private rooms. As for hotels, if you're visiting in the off-season, particularly if you have the guts to book last-minute, NEGOTIATE! Most business would rather fill a room at a lower rate than not have it booked. If you don't ask, you'll never know! Okay, the biggest truth in the belief about Costa Rica being expensive lies in grocery stores and restaurants. My heart stopped at the prices the first time we went into a grocery store in Costa Rica. I’m so grateful to have been introduced to the Costa Rican farmer’s markets that happen in every mid or large sized town, once per week. They are INCREDIBLE and CHEAP, CHEAP, CHEAP. There is nothing you need that you cannot find at one of these markets. Aside from the money, its one of the best cultural experiences in Costa Rica. You will see and try things you’ve never heard of before. You will negotiate and laugh with local farmers. Some of my favorites are the central street market in San Jose, the Friday night farmers market in Quepos and the Thursday morning market in San Isidro. If you want more organic, vegan and artisanal items check out the Tuesday morning market in Tinamaste. For restaurants, what you want are the “sodas” – these are small, family-owned cafes in every town. These restaurants will generally serve a “tipico” meal consisting of rice and beans, plantains, a cabbage salad and the meat or fish of the day. A meal in a touristy restaurant (like the god-awful but famed “airplane restaurant” in Manuel Antonio) can run between $10 and $20 dollars but a meal in a soda will be between $3 and $8. In Costa Rica, there are plenty of official red taxis and private shuttles to take you where you want to go, and for the experience, you should taken them once or twice – but they are PRICEY. A better option is the bus. They are safe, well-organized and inexpensive, with routes between every major town. Also, look for and ask the locals about “collectivos” – these are basically private drivers that stop near bus stops and pick up people in their own cars or pickup trucks– the typical charge for a collectivo is $1. But beware, they will PACK people into teeny cars. We have had some really fun collectivo rides. Look for local entrances to parks and hiking trails outside of official National Parks. Now look, Costa Rica has some of the best national parks in the world, often full of wildlife and hidden waterfall pools and you shouldn’t skip them – but expect to pay. Entrance fees for foreigners can range from $15-$75. Do the parks but on your second day, when you just can’t get enough and want to go back for more but don’t want to pay another fee, ask the locals where they hike – typically there are alternative places near or on the outskirts of the parks that are just as incredible if not more so and won’t have the crowds. Local kids can be your best tour guides – and they work cheaply. $5 can often get you a fully guided hike to crystal blue pools to swim in. (we found this to be true for Mexico as well). Please tell us in the comments what your money-saving tips are for Costa Rica!